One celebrity, at least, hasn't ignored flooded Nagaland, which has all but been eclipsed by the floods in Kerala. 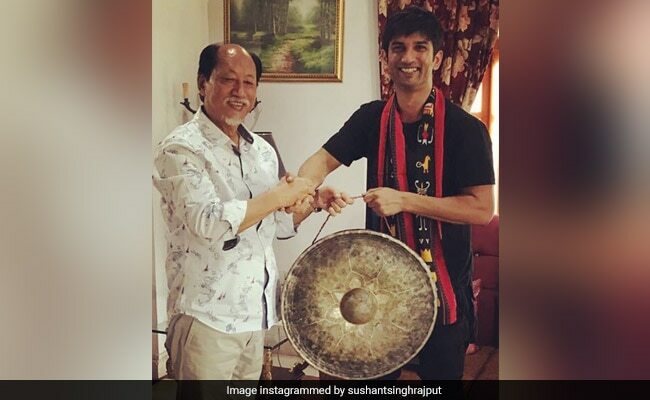 This week, Sushant Singh Rajput personally handed over a cheque of Rs 1.25 crore to Nagaland Chief Minister Neiphiu Rio towards relief operations. Sushant, 31-year-old, posted a picture of himself with Mr Rio two days ago, in which he receives a token of acknowledgment from the chief minister. "Thank you Sir for your precious time. We promise that we with our full force and determination would work incessantly till the time our Nagaland is perfectly restored. And thank you so much for this wonderful friendship Gong, the sound surely celebrates an everlasting friendship. Thanks once again Sir for your hospitality," Sushant wrote. The comments thread on the post is full of appreciative responses saluting Sushant Singh Rajput for his contribution. The actor is trending today. Chief Minister Neiphiu Rio thanked Sushant for donating towards Nagaland flood relief efforts with a post on Twitter. "I am moved at the kind gesture made by Sushant Singh Rajput and his team towards Nagaland Floods and willingness to help Nagaland at this crucial hour. Your contribution is encouraging and I hope to see the rest of the nation come forward selflessly, to donate for Nagaland," he wrote. Sushant Singh Rajput previously donated a sum of Rs 1 crore to Chief Minister's Relief Fund for flood-hit Kerala, doing so on behalf of a fan who had tagged him in a comment. "Sushant Singh Rajput, I don't have money but I want to donate for the flood. How can I donate? Please tell me," a fan wrote. Sushant assured his fan that he would donate in his name and later posted a screenshot of his contribution, along with the Instagram conversation he had with the fan. Many, many celebrities - including elder statesman of Bollywood Amitabh Bachchan - donated to Kerala - Sushant is the only famous name we currently know of who has also made the same effort for Nagaland. On the work front, Sushant Singh Rajput is currently filming Kizie Aur Manny, the Hindi remake of Hollywood film The Fault In Their Stars.